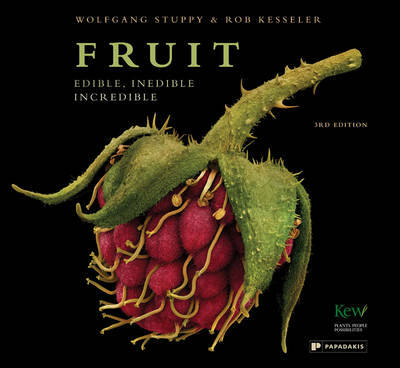 Following the award-winning Seeds: Time Capsules of Life, Wolfgang Stuppy and Rob Kesseler explore the fascinating world of fruits through a unique presentation of extraordinary images from around the world accompanied by a lively explanatory text. Fruit. The word itself conjures up mouthwatering memories of crunchy apples, luscious strawberries, sweet bananas, succulent melons and juicy pineapples, to which we can add the splendid tropical fruits on our supermarket shelves. They are one of nature's most wonderful gifts but providing us with a healthy source of food is not the reason that plants produce such delicious fruits. It is therefore quite legitimate to ask what fruits are, and why they exist. As will be revealed, the true nature of fruits is concealed in what is buried in their core: their seeds. The key role that both play in the survival of each species explains the manifold strategies and ruses that plants have developed for the dispersal of their seeds. Whether these involve wind, water, humans, animals or the plant's own explosive triggers, they are reflected in the many colours, shapes and sizes of the fruits that protect the seeds and in the extraordinary way that some fruits have adapted to the animals that disperse their seeds, and the animals to the fruits they relish. In this pioneering collaboration, visual artist Rob Kesseler and seed morphologist Wolfgang Stuppy use scanning electronmicroscopy to obtain astonishing images of a variety of fruits and the seeds they protect. Razor-sharp cross-sections reveal intricate interiors, nuts and other examples of botanical architecture and reproductive ingenuity. The black and white microscope images have been sumptuously coloured by Rob Kesseler highlighting the structure and functioning of the minuscule fruit and seeds some almost invisible to the naked eye and in so doing creating a work of art. Larger fruits, flowers and seeds have been especially photographed. The formation, development and demise of the fruits are described, their vital role in the preservation of the biodiversity of our planet explained. Fruits are the keepers of the precious seeds that ensure our future; some are edible, others inedible and many, quite simply, incredible.